How a land that still hosts hundreds of ancient churches became a country where less than 0.5 percent of the population is Christian. This article aims to summarize how this land that still hosts hundreds of ancient abandoned churches became a country where less than 0.5 percent of the population is now Christian. When the early Church survived persecution and internal turmoil, the Faith spread in Asia Minor like wildfire. That is, until the sword of Islam was drawn and reached the Mediterranean in the eighth century. In a few centuries, Muslim Turks would find their way to Anatolia and claim these ancient arable lands for their nomadic tribes. By the beginning of the 11th century, Asia Minor was overrun. From its earliest days, the Ottoman State was governed by Islam. Muhammad had supplied all the makings of a powerful empire that would one day challenge the Christian West. By the end of the 13th century, Anatolia was overwhelmed with smaller Turkish tribes that needed to be united. As daunting as this task was, Osman’s sons eventually managed to pull all the Muslim Turkish tribes together under one banner, finally paving the way to a more centralized government that could focus on internal affairs as well as expansion to other lands. During the conquest, new lands were looted and many Christians were taken as slaves. Although the initial contact with the Ottoman army inspired fear, it was not enough to stabilize the rule of the empire. The Ottomans were militarily equipped to conquer vast lands in a matter of decades, but the sword did not necessarily provide a means to rule. There were Christians and Jews living in these new territories, especially once the Balkans started to become part of the Empire. Of course, it was desirable that all these infidels became Muslim, but the sultans were clever enough to know that coercion to convert to Islam would do nothing but incite instability and rebellion. Surely, there were subtler ways to ensure submission and the decline of Christianity. The first step was to impose the millet system and demand the jizya from the Ahl-al Kitab (the People of the Book, i.e., Jews and Christians). The system gave the non-Muslims a way to survive under the Ottoman rule, but also made sure that they were in the end subjects of the sultans. Under the millet system, Christians and Jews were able to conduct their religious affairs according their own laws. However, being second-class subjects, Christians and Jews were expected to dress a certain way, defer to Muslims, and keep their buildings shorter, according to the Shari’a. Needless to say, segregation between the Muslims and non-Muslims continued, as different millets were treated as a community. The second step was the mandatory relocation of groups of people. This method included moving villages of Muslims to new Christian territories, and Christians to already Muslim areas. Over the years the dominant religion would seep into the other, eventually transforming the society into one with a more Muslim outlook. Another method of promoting Islam was the devshirme system. Early on, the sultans knew that the foremost bane of an empire was feuding among the ruling elite. However, if the top levels were filled with those who had no family connections and no realistic ambition for the throne, then most of this drama could be avoided. In addition, the ever-growing territories of the empire needed an ever-growing supply of soldiers. Most of the foot soldiers were common people and the peasants who would join the military expedition from time to time, but the empire needed a stable and loyal standing army. The devshirme system provided a solution to both of these problems. Devshirme—“collecting” in Turkish—was the blood tax Christians needed to pay when Ottoman military officers came to collect boys aging between eight and 18 (the younger the better) once per year. The boys would then be forcibly converted to Islam and educated not only in military arts but also religion, history, and state affairs. Those who showed talent and intelligence in the matters of state were then sent to serve in the palace, while the remainder formed the core army called the Janissaries. This cruel but initially effective method assured that the Christian population always knew its proper place—they were mere slaves (kul) of the sultan. There were numerous viziers and minsters who were devshirme, who kept the power struggles around the throne to a minimum, and who were disposable if the sultan wished. It is true that as the devshirme rose in the state or became Janissaries, their social and economic status would increase, but nevertheless the cruelty of devshirme system eventually led to its decline and abolishment in the 17th century. Then, of course, there is Armenian Genocide. The Turkish government’s claim was that it was the relocation of a disloyal people for the benefit of the empire. It started with the banishment of several hundred intellectuals and leaders from Istanbul to Ankara in 1915. Following the mass killings of able-bodied Armenian men, most of whom lived in Eastern Anatolia, the women and children were deported to the Middle East, resulting in a death march during which thousands died from starvation, diseases, and cruel treatment. Nearly 1.5 million Armenians were killed during the years leading up to World War I. Even though many in the West and most historians in Turkey claim that Ottoman Empire was a place of tolerance and peace for non-Muslims, an honest look at the facts suggest that the sultan’s government was cunning to let the Christians and Jews practice their faith under the conditions of dhimma, while making sure that everyone knew their place. The leash was long enough to survive under the control of Islam, but not long enough to give even the illusion of freedom. As a result of high taxes, relocation programs, the devshirme system, genocide, and other social and legal pressures stemming from a life under Muslim theocratic states, the Christian population of the Ottoman Empire slowly decreased. In my previous article Islam, ISIS and Turkey, I mention how Mustafa Kemal Ataturk implemented a myriad of reforms in a short time after the War of Turkish Independence. The sultanate and the caliphate were abolished, and a more Western outlook was adopted. To ensure that these reforms stayed in place, a strong military and ongoing indoctrination under compulsory state education were also put in place. Mustafa Kemal had the daunting task of forming a nation state from the ashes of a Muslim empire. There were two ingredients that were already in place: Turkishness and Islam. Since most other ethnic groups had managed to break away from the empire (like the Balkan and Arab nations), the majority of what was left by 1923 was Turkish. Kurds would remain a suppressed minority from then on. Turkishness was more important than everything else. “How happy is the one who calls himself a Turk!”—Mustafa Kemal’s quote became the national motto. The most important part of being Turkish was being Muslim, but not “too Muslim,” like the Arabs. Mustafa Kemal would have probably preferred a religion-free society, but even he did not have the power to change people’s hearts. So he made sure that what remained in Anatolia was not the Islam of the Ottomans, but the softer Islam of the new republic. In order to hold the fragile country together, the idea that every other nation in the world was looking for ways to divide and conquer Turkey was pervasive. If you were not Turkish and Muslim, then you were under suspicion. The importance of religious purity in the new nation state could easily be observed in the case of population exchanges between the Greek and Turkish governments in 1923. Even though hundreds of thousands Greeks had fled Anatolia following the mass killings prior to World War I, Greece—which had declared independence from the Ottoman Empire nearly a century ago—together with the Republic of Turkey agreed on a population exchange based not on language or ethnicity, but on religion. As a result, 1.3 million Anatolian Greeks and 500,000 Muslims in Greece were moved from their land and homes. This was a major shift in the religious make-up of the society. The population of Turkey had been less than 14 million, and the Greek Orthodox, constituting more than 10 percent of that population, now lived on the other side of the Aegean Sea. They were the last largest group of Christians in Anatolia following the Armenian Genocide. Mustafa Kemal’s new country was thoroughly Turkish and predominantly Muslim. The problems Turkish Christians face extend far beyond the little box on your identity card that requires you declare your religion. Those who are born in a Christian community, like Assyrians or Armenians, keep to themselves. Their names are usually very different-sounding from those of their Muslim neighbors, and one often hears comments like, “They are Armenians, but they are good people.” My grandmother had two levels of fury that encouraged the grandchildren to find a place to hide: “seed of a Jew” and “seed of an Armenian,” both of which were utterly insulting for a Turk. Multiculturalism in the Ottoman Empire never existed. Now that there are far fewer Christians in Turkey, it is unlikely that your regular Turkish Joe will suddenly become more accepting of Christians. Converts and those who try to spread the Gospel are seen as traitors, or even spies. Many converts are accused of betraying their country for money. Most Turks believe the lie that every Bible in circulation contains a $100 bill; I have yet to find one, but I happen to be very unlucky. The word “missionary” has such a stigma that it is avoided like the plague by every Christian in Turkey. For many, becoming Christian means losing at least family and friends, and perhaps much more. There are those who have to hide their conversions because of fear of ostracization and animosity, and there are those who are put under house arrest for bringing shame to their families. Finally, there are those who pay the ultimate price. In February 2006, Father Andrew Santoro, a 61-year-old priest, was shot to death as he knelt in front of the altar in prayer in Trabzon, a city on the coast of the Black Sea. The murderer, a 16-year-old male, was heard shouting “Allahu Akbar.” When I visited Santa Maria in Trabzon with a Protestant friend of mine, the doors were open, but there was no one inside. When we finally found someone to talk, a family with a small child and the caretaker of the church grounds invited us over for a cup of tea at the small backyard hidden behind the church. They made sure to lock the doors tightly. The family was Protestant, and the caretaker Catholic, but living in a conservative town where the priest of the only Catholic Church was murdered had brought them together. The priest who traveled from a different town to administer the sacraments to Father Santoro’s flock was later stabbed by a man who said the priest was guilty of missionary activities. In January 2007, Hrant Dink, the editor-in-chief of the Turkish-Armenian newspaper Agos was murdered by a Turkish nationalist. Dink was a vocal critic of Turkish denials of the Armenian Genocide and was accused of insulting Turkishness on many occasions. Death threats were part of his life, until someone decided to make good on their promise. When Dink’s murderer was arrested, he was received as a hero at the gendarmerie station, posing with smiling soldiers. Even though those in the photo were later dismissed, it was a clear indication of how the murder of someone deemed a “traitor” was perceived not only by the people but also by the authorities. In April 2007, three Christians who worked for a publishing house in the southeastern city of Malatya were attacked and tortured by five men, and their throats slit. Two friends of mine were the ones who found the door to the publishing house locked as the blood of the slain Christians poured into the hallway. After all these years of trial, perjury, questionable decisions, and alleged involvement of the government, there has been no justice. I knew two of the victims of the Malatya attack, as well as the people who discovered their slain bodies. The day after the attacks, I was going to a meeting on a bus, and for the first time since becoming a Christian five years before, I feared for my life. Until then, being an introverted geek and living in the capital city had given me a false sense of security. In June 2010, Bishop Luigi Padovese was murdered by his driver, who first stabbed the man for whom he had worked for five years, and then slit his throat while shouting “Allahu Akbar.” The bishop was slain in Antioch, the home of St. Ignatius. 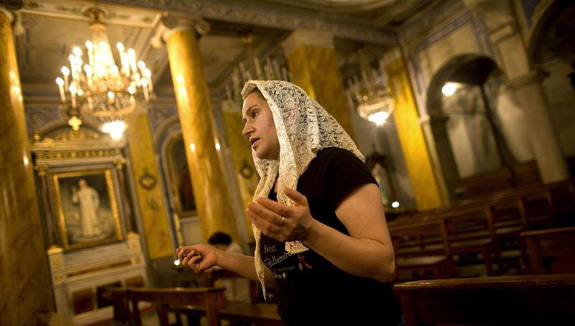 In Turkey there are constant threats and intimidation against churches and church leaders. Priests and pastors get death threats regularly. It is the way of life for most Christians in Turkey, and the continual fire has the tendency either to make one stronger in the faith or to cause one to drift away, especially if you are a convert. Yes, there is persecution in Turkey for Christians, and yes, it is hard to be a follower of Christ. In Turkey, as a Christian you are always aware that somehow you do not belong to the folds of your own sheep. Not that your life is always in danger, but there is a snide remark here and a verbal attack there. You are not sure you are going to be able to get a decent job because of that little box on your identity card. However, the joy I felt when I saw a church around every corner in America stemmed from the misguided feeling that things were easier for followers of Christ here. In Turkey, the sense of “otherness” pushes you to reach for more fellowship, more prayer time, and more awareness of this world’s fleetingness. Whereas in America, I find that the comforts offered by the wealthiest nation in the world are distracting. Having a house to live in, a car to drive, and endless entertainment to distract from the things that matter can make one lukewarm. St. Paul was born in Tarsus, not far from where my family lives. He was kicked out of my home town, Iconium, and was imprisoned in Ephesus, where we recently held a Christian camp to remind hundreds of teenagers why it is worth it to keep our eyes on Christ. Thousands of years ago, because of constant efforts of the missionaries, the blood of the martyrs, and the unwavering faith of so many Christians, the infertile lands of Anatolia slowly became receptive. Then, because of a violent and intolerant religion, coupled with division among Christians in Europe, the lands where our Blessed Mother lived her last years on Earth have returned to a time when followers of her Son feared for their lives. Having grown up in the culture created by Islam, I have witnessed firsthand the oppression and even persecution that exists in Turkey. However, I do not believe that Muhammad’s followers would have become so influential if Christians had remained faithful and undivided. We must see and understand what has happened to the thousands of churches and millions of believers in Turkey over the course of centuries, not so we can be hateful or vengeful, but rather so that we can awake from our Laodicean slumber and defend the Faith that brought civilization to the barbarian Roman Empire and continues to bring authentic hope and joy today. Benjamin Braude, “Foundation Myths of the Millet System,” in Christians and Jews in the Ottoman Empire: The Functioning of a Plural Society, ed. Benjamin Braude and Bernard Lewis (Teaneck: Holmes & Meier Publishers, 1982). Moshe Ma’oz, “Middle Eastern Minorities: Between Integration and Conflict,” Policy Papers 50 (1999). Halil Inalcik, “Ottoman Methods of Conquest,” Studia Islamica II. Paris. pp. 104-29. Göçek, Fatma Müge (2015). Denial of Violence: Ottoman past, Turkish present, and collective violence against the Armenians, 1789-2009. Oxford University Press. Ioannis N. Grigoriadis, Instilling Religion in Greek and Turkish Nationalism, Palgrave Macmillan. New York, 2013, 60-76. Crossing the Aegean: The Consequences of the 1923 Greek-Turkish Population Exchange (Studies in Forced Migration). Providence: Berghahn Books. 2003. For first-hand accounts of those who moved to Turkey and Greece, see Twice a Stranger by Bruce Clark. “The Missionary and the Headscarf,” in Muslim Nationalism and the New Turks by Jenny White, Princeton University Press, New Jersey, 81-101. Protestanlar: Tehdit Cok (“Protestants: ‘Threats are abundant’”); Yine rahibe saldırı yine genç bir zanlı (“Again an attack against a priest, again a young perpetrator”). Derya M. Little has a PhD in politics from Durham University, England and an MA in history from Bilkent University, Turkey. She is the author of the new book From Islam to Christ: One Woman's Path through the Riddles of God (Ignatius Press, 2017).